I talked with Adam Weinstock, president of Creative Concept Productions. Adam has produced shows on and off Broadway since the 1996 revival of Mart Crowley's The Boys in the Band. He has worked closely with Bruce Vilanch, Lea Delaria, Judy Tenuta, Charles Busch, Margaret Cho, Ellen Greene, Paula Poundstone, Michael Feinstein, Sandra Bernhard and Linda Eder during the summer Creative Concept Productions theater events in Provincetown, Mass. I talked to Adam about his 2012 Provincetown line-up which includes Lisa Lampanelli, Margaret Cho, Linda Eder and Paula Poundstone. Adam also talked about issues facing our LGBT community. First of all they're human rights and because I'm a person in the community I think we fight for what's important to us and it becomes not necessarily our charity. I have a good friend John Bartlett and he does a lot of work for PETA. Obviously he's not a member of that group of animal society but that's what calls to him and what calls to me is the LGBT community probably because I'm a member so I figure that doing something good for the community and selfishly I'm helping myself. If I give money to marriage equality I'm helping myself in the long run. If I give money to AIDS research I'm helping myself in the long run so I think it's selfish even though it's humanitarian. I'm a gay man. You can't turn your back on your community and if you turn your back on your community you're turning your back on humanity and you might as well be a hermit and live somewhere but you need other people to live. You need books to read and entertainment to go to and food to eat and unless you're a farmer with a vivid imagination you can't be isolated. You have to put your faith in the world and try to do something good. I guess you don't have to, but I think you do. That's my commitment to the community and I always find plays with our themes but our theme is out there. Any play that I produce is being produced by a gay man so it becomes an LGBT play because I have taken an interest in it and created, supported and paid for it. If I make an omelet it's a gay omelet and it's masculine because it's made by a man, a gay man. So there it is. If this play is produced by a gay man though the actors, writers, and directors may not be gay it becomes part of us. I caught Creative Concept Productions Lisa Lampanelli's show in July, which was fabulous. Margaret Cho is appearing at the Art House in Provincetown August 11th through August 18th during Carnival Week. 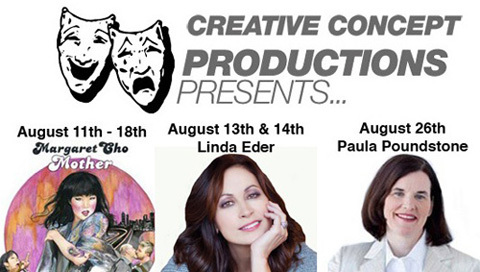 Linda Eder is also appearing on August 13th & 14th at the Crown and Anchor. Paula Poundstone will be appearing at the Crown and Anchor on August 26th. Provincetown is offering amazing performances by topnotch entertainers all summer long so you still have time to take in a show.